Midnight Seattle. Seattle WA. Jan 2009, Gavin Seim. 2010 PPA Loan Collection. 2011 PPA Magazine. The limited edition has been released as a 40×24 classical canvas, edition of 100. $495.00. Contact Gavin for availability. This image was admitted into the 2010 PPA International Loan collection. Details here. It was published in the June 2011 issue of Professional Photographer Magazine. When the sunlight fades, the light does not. 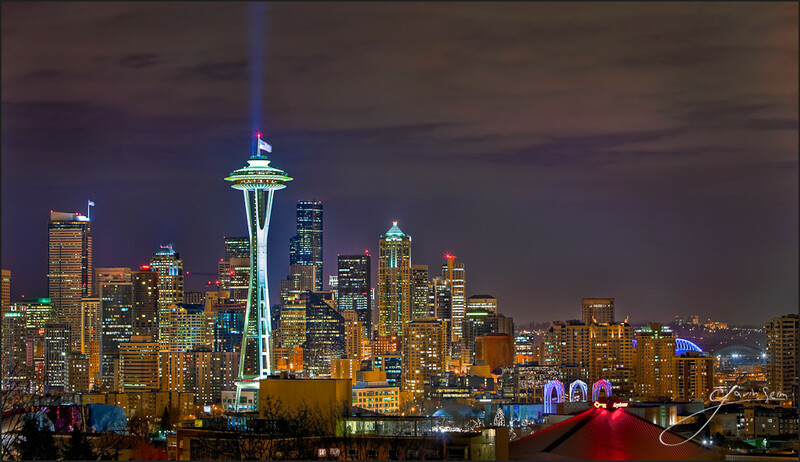 Seattle is a spectacle to be seen, even at the strike of midnight. It’s festive colors crowned with the centerpiece that is the Space Needle. At 605 feet tall, it still stands proud and modern, though nearly fifty years old. When the view is just right and the traffic dies down, the bustling metropolis becomes a tranquil wonderland of light and color. Well, from a distance at least. This was made at about 1AM from Kerry Park. The result is just what I hoped for from this mild winter evening. I enjoy the bold definition and tonal range, but also that the Space Needle is the primary object in the scene, complemented by the city. A gently applied dynamic range process allowed me to keep the lights and shadows in control and pull the tones of the city into a cohesive story. Release details: Prints Available.. Order Open Edition originals above.. Signature Limited Editions are listed below and can be ordered by contacting gallery. Canon 5D MK2. 70-200L 2.8 at 95mm. f5.6, ISO 640. Bracketed, 10 sec, 2.6 sec, .6 sec. This is done using a bracketed HDR technique. I processed in Photomatix, but kept it gentle. I find that’s the key to a good HDR. It’s often associated with a specific look. But as we discuss heavily in my workshops, HDR is not a fad or a style. It’s about dynamic range, about light. Whatever approach you process it with, a balanced process generally pays off as it puts you in control. After the initial blend I went on to detailed tonal work in Photoshop, largely very specific burning and dodging to control the tone and visual direction. I took my time and towards the end used my Hill of Lucas effect from the Hollywood Effects toolkit really make the edges and lines pop. The city light reflecting off high clouds was also a little tricky. The dynamic range of the bracketed HDR capture brought out the purple hues. They’re not bad, but I had to use caution to keep thing looking natural and keep the color gradients smooth. This type of sky is very susceptible to artifacts when doing detailed edits. Again, I just took my time on this one. Working in 16 bit also helped avoid banding issues. The close up detail in the full size version is really good. You can almost see people eating inside the restaurant at the top of the needle and that makes for a great print. It came out well and looks really good on canvas. This image has gone quite a few places and I’m proud of it. I featured how this was processed in my HDR Magic video workshop. Check that out here. This entry was posted in beauty, color, f164, Fine Art, nature, technique and tagged award winning, city, clouds, downtown, dynamic range, eating, f164, hdr, needle, night, nightime, nightscape, restaurant, seattle, space, urban. Bookmark the permalink. Fabulous. I have yet to get much into HDR. It’s on the list though. Incredible photo! Definitely one of the most beautiful cities in the world and you captured it perfectly. Nice work.